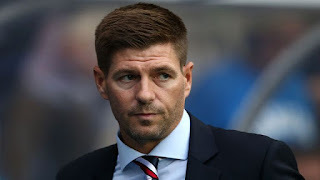 Ibrox Noise: Has Steven Gerrard fixed a huge Rangers problem? Has Steven Gerrard fixed a huge Rangers problem? If one thing has stood out about Rangers teams over the past six years, it’s been the diabolical defences. Ever since internationalists Carlos Bocanegra and Dorin Goian left, Rangers fans have suffered a succession of dismal centre backs, all equally hapless in their own unique ways, until a slight improvement over the past two seasons with the likes of Clint Hill and Danny Wilson in tow. It still wasn’t good enough, and last season Rangers leaked a tonne of goals, as has been the norm for way too long. When Steven Gerrard was made manager, his first comment about what he’d actually do with the squad was defence – to sort it out, make it a priority and quite simply fix it. Everything else would follow on once that was remedied. While it is early days in his Rangers regime, and Ibrox Noise (among others) have been critical of certain aspects of his decision making and management choices, the one thing we’ve been universally positive about has been his work on the defence, and the performance of it. While James Tavernier remains a law unto himself, the four new additions of Jon Flanagan, Nikola Katic, Connor Goldson and Allan McGregor have made a quite incomprehensible difference to the backline, and, messy goal to TNS inside five minutes of a close-door friendly in Gerrard’s absolute debut aside, the entire succession of clean sheets in now four matches (three of which were competitive) is night and day compared with the constant leakage of recent times. We’re not saying defence is fixed, but after six years of dismal rearguards, to have something akin to what could be a Rangers level defence is thoroughly welcome. Let’s not get ahead of ourselves – this is a four-man defence who have two international caps between them – and some fans have been critical of Jon Flanagan while most accept James Tavernier’s failings. But few have had a bad word to say about Croat Katic and ex-Brighton lad Goldson, while Allan McGregor has been completely imperious and looks like he never left. Of course, ‘tougher tests’ are to come (seems to be a disclaimer to any praise these days), albeit we’re only feeling they will be in UEL and against Celtic. Osijek are a cut above most SPL sides and Rangers’ robust defensive showing stood us in good stead to cope with what the Scottish game’s finest can throw at us. Equally, of course, while the quality of Osijek is equal or better to most of the best of the SPL, the aggression the SPL offers is miles more extreme, and that is something our defence must be ready for. If pre-season competitive results are anything to go by though, this defence might just be ready to handle the domestic front. no Stuart it IS his performances. He was atrocious against Osijek - especially in the first half. He might be better on the right but he cannot be kept in at left back - better teams will rip him to shreds there. This site and John frequently disagree, but on this one we'd partially support - he did have a poor first half, albeit a marginally better second one. His worst display in our shirt we felt, and hopefully this is not to be repeated. Incidentally John, who 'is' a better team than a pretty strong Croat outfit? As we say, beyond better UEL teams and Celtic, we're coming up short with examples. He’s barely played in a couple of years. So one bad game while settling in isn’t a problem to me especiallt when out of position. The Croat outfit maybe better technically..but what happens when the Hibs Aberdeens and even the Hearts of this world run at you all day and are more physical ?...I agree with John unless he improves dramatically we will have problems and If you are going to play him right back who do you drop if you push Tav up because I really believe we need 2 upfront in most games. I hate to say it again but Tav was the weakest link defensively. The new guys seem organised and whilst its early days, much better than Wilson etc. we could bring in big lee at left back , flanagan rb and john and tav in front of them which gives us security? steven davis in midfield alongside arfield or a mc ginn and a front two of moult and maine, or moult/morelos meantime? Scooby Wallace and Tav have always been abandoned in that every manager expected them to be Winger Midfielder and full back. Flanagan is a superb bit of business given his experience and pedigree . He will have a huge role to play in our Title Win . Taverneir will be better pushed forward I think ...but we need options at left back Lee Wallace not the answer . Flanagan is great, Goldson & Katic, like-wise. The only one I have doubts about, is Tav. The amount of times I think he thinks he's a midfielder. ?? He is now, the weakest link in the whole defence, for me. He need to be checked, from doing that. For The CB Issue ...Tosin Adarabioyo! I think this "Tav is a law unto himself" nonsense needs to stop. Tav plays according to the instructions given by his manager - simple. My take on this is that he sets out with a four which quickly switches to a three when Tav (as instructed) moves forward to be an attacking threat. Hence the use of Flanagan on the left rather than DJ. In the past, both full backs have been given licence to get well forward - this now seems to be just Tav as Flanagan is thought to be better defensively. This latter point needs to be proven as he looked anything but competent at Bolton last season - here's hoping he lives up to his early career potential. I thought DJ was injured just now l?